Our molding shop has 16 machines at two facility which are micro-processor based and have PID temperature control. All these machines have adequate material loading facilities like hopper dryer and auto loading. we also have two mold temperature controller and hot runner units. 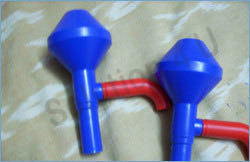 We also have 3 hot air circulating pre-dyeing over for raw material pre-heating. These machines are used for plastic molding solutions, plastic molding design solution etc. We use sophisticated machines for a variety of thermoforming applications like fiber reinforced plastics, reinforced plastics, fiber plastics, fiberglass reinforced plastics. These fiber reinforced plastics, reinforced plastics, fiber plastics, fiberglass reinforced plastics are mainly used for packaging in food industry. We have in-house sheet extrusion equipment that enable us in faster and large scale production. Roll fed machines and sheet fed machines are installed for large volume and small volume production respectively. The two processes can be carried out independent of each other to solve the complexities of sheet extrusion equipment and thermoforming machines. Vacuum forming is a sheet forming process, which involves the formation of thermoplastic sheets into three dimensional shapes through the application of heat and pressure. Sophisticated machines and equipment are installed for high level of vacuum forming. Roller cutting machines, form filling seal machines, automatic blister machines are some of our highly productive and useful machines. Blow molding is a manufacturing method used in the plastics and polymers industries to create hollow but strong containers for their clients. Plastic beverage bottles and fuel tanks are commonly created through blow molding. A typical blow molding machine set-up uses an extruded plastic preform and compressed air to fill the chamber of a divided mold. The two halves of the mold separate and the finished container is released. This plastic dip molding process is unique for getting soft hollow part of any complicated shape easily and effectively, mostly PVC dip molding resign has been used to get parts in any color require. This plastic dip molding process is simple and unique dipping of aluminum punch into resin and curing has been done over process Parts can be develop with minimum initial investment with superior surface finish. This is it labor oriented process and slow for very high production requirement. This is process mainly set to achieve thin wall product as well advisable to fast cycle molding with minimum of warpage, We have developed successfully container lid , It require few special feature in machine and tool but can be handled well by normal processor. This are mainly supporting and important part of any quality production system, they not only control quality of the product but increase production efficiency in most of the cases. There are number of accessory like Hopper Dryer, Loader, De humidifier, oven, material handling trolley, fork lift, Oil Circulating unit, hot temp controller, chiller etc., which confirms the self certification of molder and generate confidence in vendor to avail quality product each time. We are equipped with a variety of CAD/CAM software including Auto CAD , Mechanical Desktop, Pro E, Solid Work, Unigraphics for 3D Modelling & Mould Designing. The company offers the functionality of a typical high-end integrated CAD/CAM Design system. In the present environment, corporate strategies are being developed based on the long-term commitment to make changes in the context of the whole organization rather than a collection of individual organizational components. CAD/ CAM Systems The strategy that is followed has proved to be effective as the first step towards automating & manufacturing related functions. It ultimately achieves the corporate objective of Computer Integrated Manufacturing (CIM). This is process similar to injection molding where specified PS material is been treated to specific density and been molded in different shape shape and size. Curing will be done with steam and cooling. Mostly this has been term as thermocole famously, used for industrial packing but there is lot of other industrial application where it can used effectively. We are doing molding for few Industrial product which are used for construction purpose and been export to develop country. We have dedicated set up, machinery, plant to handle volume material production jobs for this process.